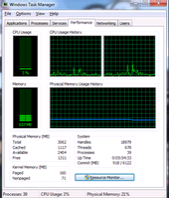 In such situations, running the Task Manager will give the "Task Manager has been disabled by Administrator" error. However, there are some techniques you can use to re-enable task manager and close those harmful programs manually. This article contains few such simple techniques you can use to regain access to Task Managing privileges. In the work area, locate "DisableTaskMgr". If this value is not there, you will need to create a new DWORD value called DisableTaskMgr. Double click on it. A window will pop up. Open Start Menu. Windows XP users click on Run. Windows 10, Windows 8.1, Windows 8, Windows 7 and Vista users, go to Search. Alternatively, press Windows key+R. In the work area, double click on "Remove Task Manager" and set its value to Disabled or Not Configured. Command Prompt can also be used to directly enable Task Manager. Run TaskManager.bat as Administrator if you use Windows 10, Windows 8, Windows 7 or Windows Vista. In Windows XP, simply open the file. A command prompt window will flash for a second and then disappear indicating successful execution. After running the batch file, you will be able to again use Task Manager. If Task Manager is still not available, restart your computer. The techniques mentioned in this article work on Windows 10, Windows 8.1, Windows 8, Windows 7, Windows XP and Windows Vista.